Figuring out how to freeze and store breast milk can be a learning curve for all new breastfeeding and pumping moms. Let’s be honest, it’s not something you’ve ever had to do before and suddenly you realize there’s tons of rules and guidelines you should be following. Don’t worry, momma. 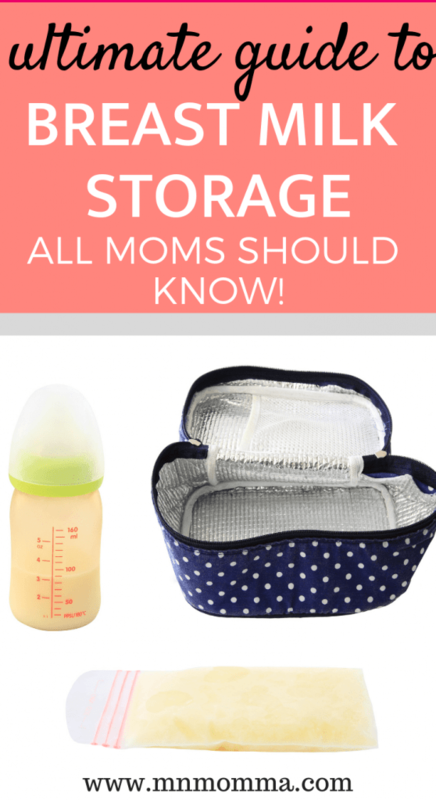 I’ve got you covered in this complete guide to proper breast milk storage! One of the first things you need to think about, is where and how you plan to store your breast milk. You have three different options to consider depending on your lifestyle, budget, and how often you plan to pump breast milk. All options you consider should be checked to ensure that they are BPA free to keep your breast milk safe. Keep reading to find out which is best for you! 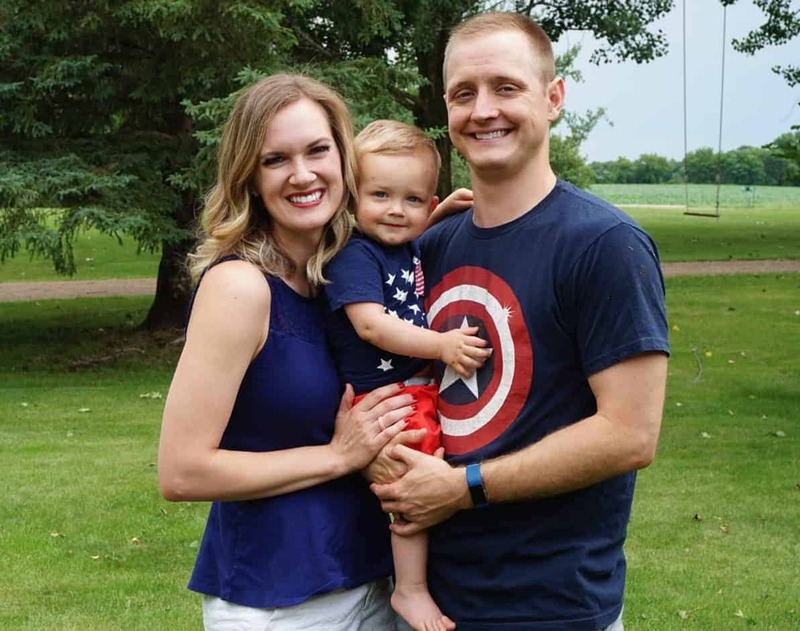 Storing your breast milk in a capped glass container can be a great option for moms who don’t plan to store a lot of breast milk and are hoping to save money. 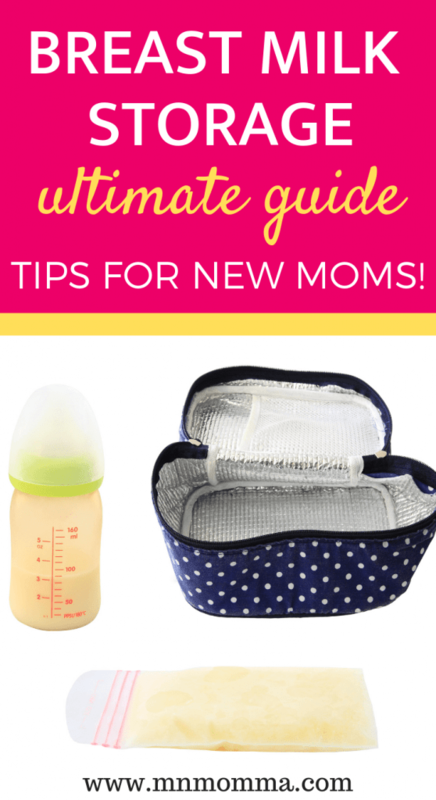 A glass container is easy to reuse and helps you see your breast milk inside. One of the down sides to using a glass container is that it can take up a lot of space. You also need to be careful that the container is placed in a safe place where it can’t be easily knocked over and broken. Spilled breast milk is heartbreaking! According to the Mayo Clinic, hard plastic that’s BPA free is another container that can be used to store your breast milk. 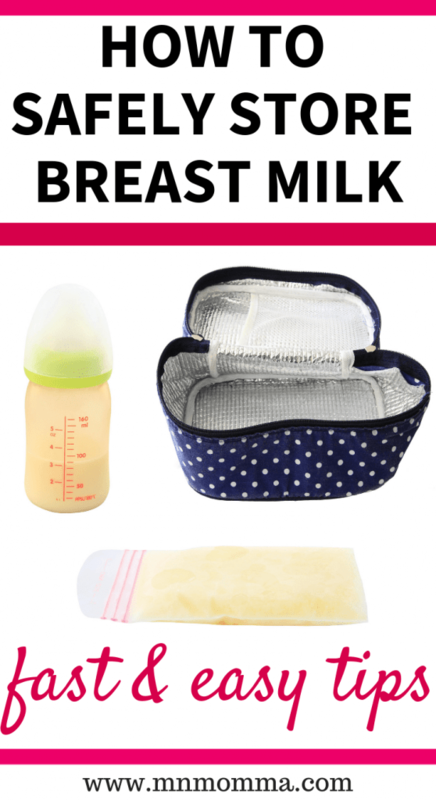 Make sure that it has a lid that snaps or screws shut to be sure that no breast milk will spill out. Just as with a glass container, you’ll be able to reuse the plastic containers frequently, but they do take up a fair amount of space in your refrigerator or freezer. A benefit to using a plastic container is that it’s less likely to break if knocked over than a glass container is. Breast milk storage bags (also commonly called pumping bags), are many moms go to storage space for their breast milk. Personally, I prefer to use a glass or plastic container for refrigerator storage and then switch to a pumping bag for freezer storage. I highly suggest using pumping bags as your method for freezer storage for several reasons. When filled correctly, breast milk storage bags are easy and efficient to store. 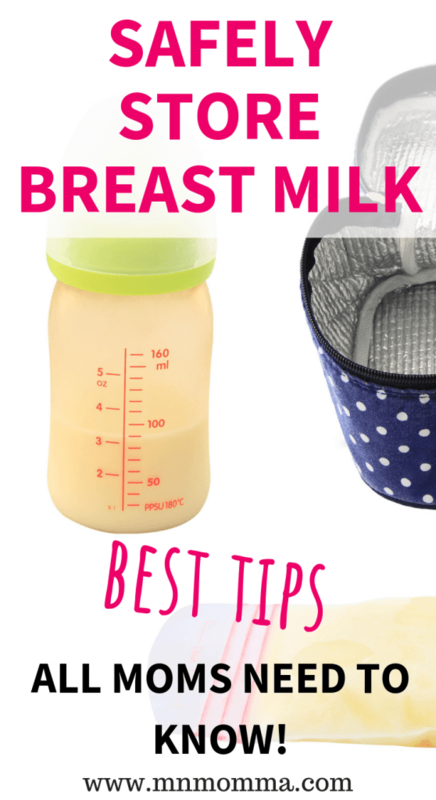 This will save you space and make looking for the right breast milk bag easy! Breast milk storage bags are ideal for moms who are planning to pump and freeze a lot of breast milk. Most breast milk storage bags also come with increments on the side to help you keep track of how many ounces are in the bag – be careful, however, as this measurement isn’t always accurate. Most bags need to be opened completely and stood upright to get a close measurement. The best way to measure is by using a measuring cup or the measurement increments on your pumping bottle. One downside to using pumping bags is that they are not reusable and the price can add up over time. Another important thing to be aware of when using pumping bags is that they rip, tear, or leak more easily than other containers; so buying bags that are meant for breast milk and are of good quality is important. These are my favorite breast milk storage bags and I’ve had great luck with them not ripping or breaking on me! I tried another big name brand first, but found these worked MUCH better for storing breast milk and freezing it. Finding out how long breast milk is good for is a vital part of pumping breast milk. You’ll need to know how long breast milk can sit out at room temperature, how long breast milk lasts in the fridge, and how long breast milk can stay in your freezer (spoiler alert: it’s not forever!). If you forgot your cooler and don’t have access to a refrigerator, it’s okay to leave your breast milk at room temperature – for a few hours anyway. Ideally your breast milk should be refrigerated within 4 hours, but if you’re really in a pinch it’s okay if it goes 6 hours. As sad as it can be, after 6 hours you’ll want to dispose of your breast milk. Many women find that storing their milk in an insulated cooler while at work or on a trip is the best option they have. Small insulated coolers can go with you whether you go and will help keep your breast milk cool. Be sure to pack your cooler with ice packs and make sure it’s well insulated. If you follow these steps your breast milk can safely be stored in a cooler for up to 1 day, then it should be properly refrigerated. If you’re on the hunt for an adorable insulated cooler, this might just be the cutest breast milk cooler I’ve ever seen. Whether your milk went straight from you to the refrigerator or it spent the day in the cooler before it made it there, there are a few important rules to remember about refrigerating breast milk. One of these is making sure you place your breast milk towards the back of your refrigerator. This is where the temperature is going to be coldest and stay the most consistent – both key features to successfully storing breast milk. Another thing to remember is that your breast milk cannot stay in your refrigerator forever – it should be used or frozen within 3 days, or 5 days if you’re in a pinch. Ahhh, building that beloved freezer stash feels so good doesn’t it? When you know you won’t be using your breast milk for the next 3 days, getting it into the freezer is your best option. While a refrigerator freezer will work just fine, a deep freezer (or chest freezer) is your best option. Just like with a refrigerator, your breast milk should not be stored in the door compartment of your freezer, but instead towards the back of the freezer where the temperature is consistent and colder. The best time to use frozen breast milk is within 6 months, however, it can be used for up to 1 year if kept in the back of your deep freezer. When it comes to actually freezing your breast milk, there are a few tips to follow that will help you have the most success and feeling like a pro in no time. No matter what method or container you use to freeze your breast milk, don’t forget that breast milk expands when it freezes! This means that you never want to fill your container or breast milk bag all the way to the top. This is a sure fire way to have breast milk leaking or exploding all over your freezer. Instead, find a larger container or separate your breast milk into several small containers and freeze. You want to be sure that there is room for expansion. Learning the proper way to freeze your breast milk may seem menial, but trust me – when you’re saving space, you’ll be loving it! The best way to freeze breast milk bags is by filling them up and freezing them flat. To do this you want to make sure you squeeze out any air that’s left in the bag before securely zipping it shut. Once you do this, find a flat place to lay your bag filled with breast milk. The flatter the better! After your breast milk has become frozen, you’ll be able move it to a more ideal location and stack or separate your breast milk in a system (like the ones mentioned below!). Filling your breast milk bags as much as you can may seem like a good idea, but trust me it’s not. While you are certainly cutting back on the number of bags needed, you’ll likely end up wasting breast milk. Instead, consider freezing your breast milk in the amount your baby typically eats. Keep in mind this will change over time as your baby grows. For example, your baby ate 4 ounces last week, but is now on 6 ounces! So what do you do? It can be helpful to have a few breast milk bags on hand that are in smaller increments such as 2 ounces and 3 ounces to help make up the difference in your 4 ounce bags. Remembering to label your breast milk is SO IMPORTANT. You’ll want to put down how the date, time, and how many ounces you’re freezing. 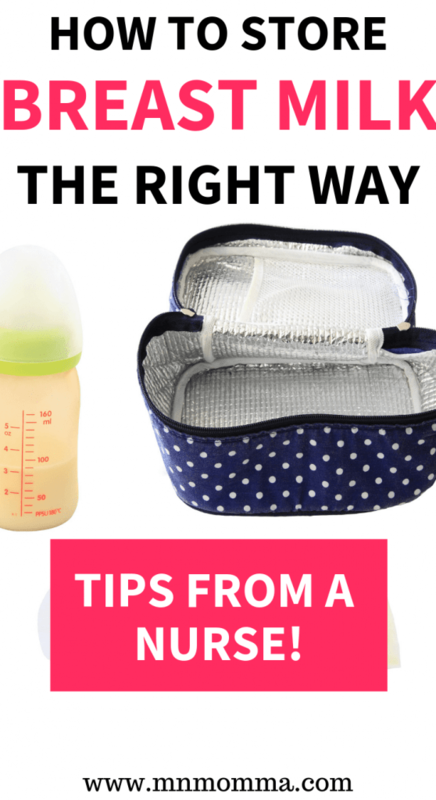 These key details will help you find the breast milk bag you’re looking for fast and easily, and help you know when it’s time to get rid of breast milk if you need to! Tip: I prefer to use a black sharpie to write my breast milk details down as it won’t bleed, smear, or puncture the pumping bag. When you add a bag of frozen breast milk to your freezer, write down the date and number of ounces. This milk log is a lifesaver! I so desperately wish I had done this with my first baby. Instead of having to go out and count your ounces (and then go count them again a half hour later because you forgot to write it down), you’ll have everything written down in one place. Simply cross off the date and ounces as you use your breast milk and your milk log can easily be kept up to date. 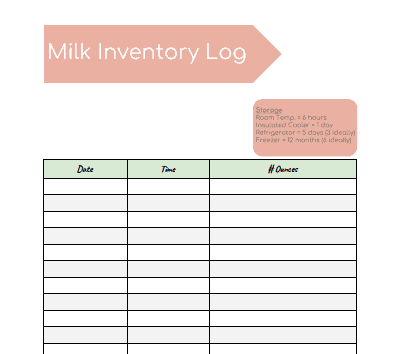 To get your free milk inventory log, subscribe to my newsletter and receive access to the resource library full of printables! A common question from new moms is can you can add fresh breast milk to frozen? Sometimes you don’t have quite enough breast milk to want to freeze it, but you know you won’t be using it within 3 days. In this case, you definitely can add fresh breast milk to your frozen or refrigerated milk! Not so fast though! You want to be sure you follow a few simple rules first. The first is that you’ll want to be sure the milk is from the same day. Keep in mind your breast milk composition can change from day to day, or even from one pumping session to the next one! The second tip is that you should be adding cold to cold. This means that you need to allow your fresh breast milk to cool down in the refrigerator before adding it to other cold or frozen breast milk. The reason behind this is that you don’t want your fresh breast milk to warm up or thaw the breast milk from earlier. There are a few genius ways you can store your breast milk freezer stash. No matter which storage system you decide is best for you, be sure that you have a method for organization. I like to organize my breast milk by date, with the oldest date first. I do this to be sure that I don’t end up using all of the freshest milk first and have to throw away older milk over time. Other organization option include organizing your milk storage bags by number of ounces (and then by date), or by time of day (then by date, then by ounces). One way to store your breast milk is in a 12 can pop box. You can easily cut a slit in one end and create an easy way to dispense the bags in order. You can check out the full tutorial at Lovely Lucky Life, this one is so easy to do and really makes a difference in organizing your freezer. 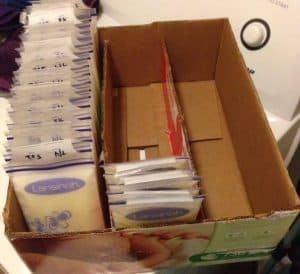 Another genius way to store your breast milk is with an old diaper box. Simply cut the top of the box off and use those cardboard pieces to create separators for your breast milk. This creates an easy way to sort through your milk when looking for a certain date or breast milk quantity. Now that you know exactly how to safely store your breast milk, you need to be sure that you’re also thawing it safely. You should never thaw breast milk in a microwave as it can get too hot or create hot spots throughout the milk. To quickly thaw milk, place your frozen breast milk container in another container of hot water. This will slowly allow the breast milk to thaw on its own. If you know that you’ll be needing your frozen breast milk the next day you can place the frozen milk in a container (to prevent potential spillage) and place it in the refrigerator to thaw overnight. Remember that once breast milk is thawed, it should not be frozen again and should be used within 24 hours. To make sure that your baby is getting the best breast milk, make sure you’ve followed the guidelines mentioned above for safe breast milk storage. Don’t forget to grab your FREE milk inventory log and find out more about pumping breast milk with Pumping 101!